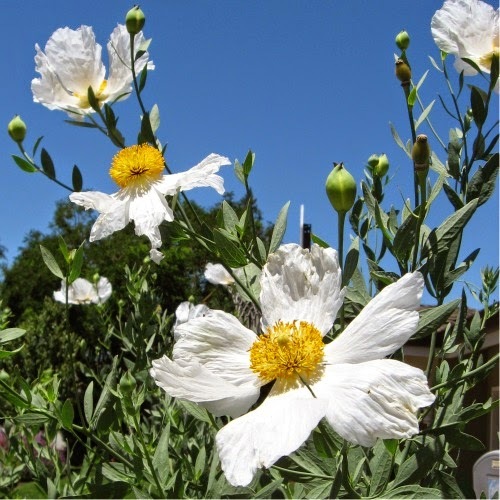 The rebate program is an incentive to convert water guzzling lawns or swimming pools into gardens that feature plants appropriate for our Mediterranean climate. Under this program plants are chosen from an extensive approved list. Rebates rates are $2 per square foot for most cities in Santa Clara County, and a whopping $4 per square foot in Palo Alto for qualifying lawns. Even lawns that have been let go dry may qualify. What does a garden look like if there is no lawn? Letting go of the lawn aesthetic opens up many possibilities that can add to our quality of life. Now there is room for a butterfly and hummingbird garden, perhaps with a quiet place to sit with your morning coffee before starting a busy day. A birdbath placed in view of a window amid greenery and flowers becomes a welcome refuge for neighborhood birds, and you get to enjoy the show. Concerned about the decline in bees and other pollinators? Choose from a long list of flowering perennials that provide food for them and beauty for you. 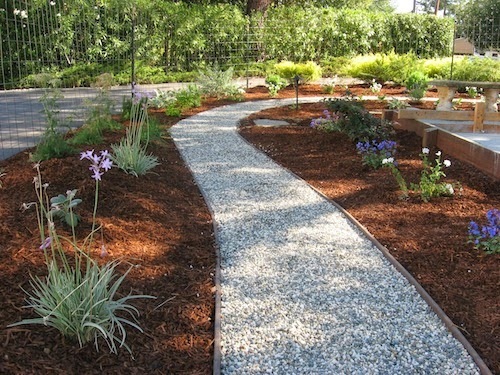 Add simple paths with stepping-stones or a rock garden with succulents to provide interest and structure. I find it extremely satisfying to include a kitchen herb garden in my lawn replacement projects. 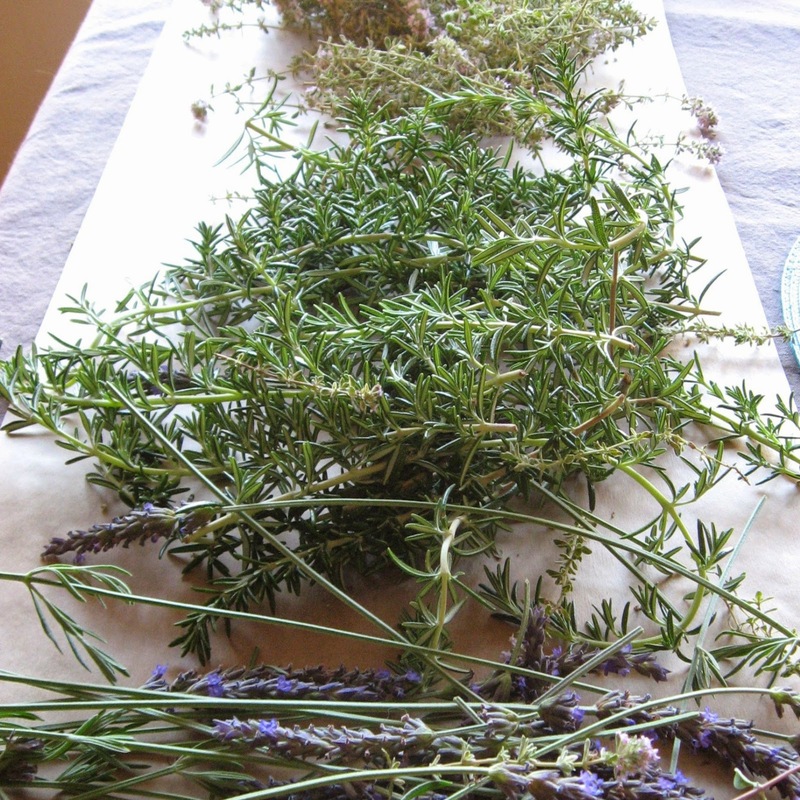 Several of our essential culinary herbs are approved low-water needs plants, including: rosemary, sage, thymes, and French tarragon. Once established they need only occasional watering. Challenge yourself to brainstorm creatively about garden features that fit your lifestyle and interests. Recently, I redesigned a front yard to include a bocce ball court at the client’s request. They now enjoy this traditional family game together, surrounded by a mix of attractive flowering shrubs, gravel paths, and seating areas for visiting together. It was satisfying to watch the visiting grandkids playing in the court together. I don’t think they miss the old lawn. First, make an appointment to get a pre-inspection survey. Water district representatives will visit your garden to determine if you qualify. They’ll take measurements of the lawn or pool, check irrigation, and let you know if you qualify. They will fill out a request for application form, and you will be sent the application package. Follow the instructions in the application package, which typically requires photos, a plant list and simple diagram (or description) of the garden design. You can do this yourself or hire a garden designer to design the space and also take care of submitting the application for you. Or hire a designer on a consulting basis, if you’d rather do some of the work yourself. A designer can help you find a landscaper too.